Does your soon-to-be partner for life have the same love for adventure as you do? Then, we recommend you shake things up when it comes to your honeymoon. Apart from the regular cootchie-cooing, bae and you can revv things up with these adrenaline pumping experiences in South India. Magical Mysore is perfect for a mini-honeymoon or can even serve as the first stop on your great adventure together. The historical city sure does put a royal spin to things and if you’d like to try your hand at a heart-stopping sport, then, this is the place. In the recent past, Mysore has become a favourite with sky divers. Sign up with adventure outfit, Skyriders, for a thrilling experience that see you drop from 10,000 feet above. Stay: At night, you can dive into each other at this spiffy hotel in town. Just a short drive away from Kerala’s honeymooner’s paradise, Munnar, Vagamon is a little known gem that’s perfect for a cosy getaway. Here, you and your beloved can jump right off a cliff and sail through the air, while feasting your eyes on a breathtaking view of the hill station. However, do note that paragliding services are not available through the year so make sure you plan well in advance. Stay: Book your lover’s nest at this picturesque homestay in nearby Munnar. Leave behind the mainland India and escape to the serene Andamans for a romance-loaded honeymoon. At Havelock, you can explore the clear, azure waters and make friends with sea creatures of all kinds. The turtles, white-tip reef sharks and the coral reefs will all add to the thrill. Stay: Dive into the sea of love at this luxury destination. Love is always in the air at this picturesque hill station that’s just a few hours from Bangalore. With its rugged hills and gushing waterways, Coorg’s terrain offers plenty for the thrill seeker. And trekking is chief among them. You and your special someone can scale the heights of Tadiandamol or explore Nishani Motte, Kotta Bette, or Kumara Parvatha. At the top of each, you will be undoubtedly be treated to breathtaking views of lush mountains cloaked in mist. Coorg is also an excellent place to try your hand at camping, microlight flying, and river rafting. Stay: Soak in the love and in the infinity pools at this luxury property in Madikeri. 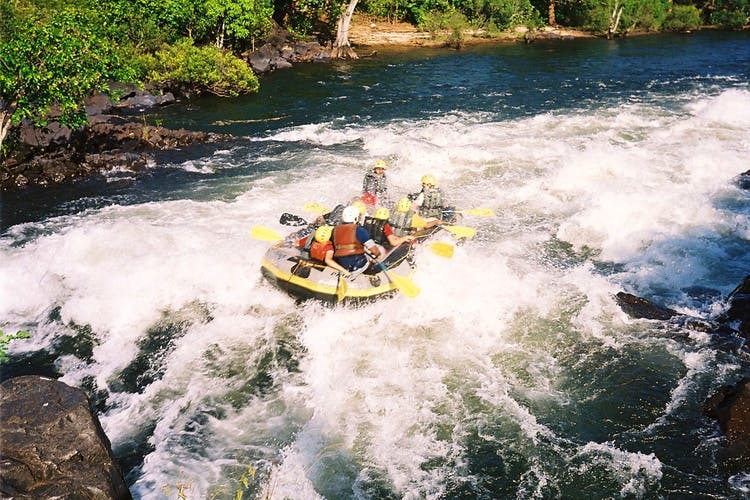 Of course, Dandeli is renowned for its tricky river bends and rapids that make it a popular destination for river rafting. But if you’d like to take things up a notch, we recommend you, lovebirds, try canyoning. Involving elements of hiking and rapelling, you and your newly-wedded bride/groom can make your way down a cliff as gushing waters rush towards you. Mahabalipuram’s golden sands and gorgeous blue waters make for the perfect backdrop to your honeymoon. You can spend your days here beach-bumming and relaxing at the laidback shacks. But when you are ready for a slice of adventure, you can learn how to conquer the waves with a surfing tutorial. Stay: Cosy up at this extravagant hotel that’s close to the main beach. Just off the coast of Tamil Nadu, Rameswaram is predominantly a temple town but with its breathtaking beaches, we can easily see it doubling up as a lovers’ getaway. Over here, you can try your hand at kitesurfing where you can glide through kilometres of unspoiled lagoons with the wind in your hair. This is a seasonal activity so do plan accordingly. Stay: The experience includes accommodation at cottages located near the Palk Strait. Explore the seas with bae at this charming, seaside town. During your trip, you can take in the beauty of this former French colony and indulge in general debauchery. You can also fill your days with diving experience at 20 sites in the big, blue sea that surrounds Pondicherry. Stay: Love it up at this heritage getaway in the French Quarter.